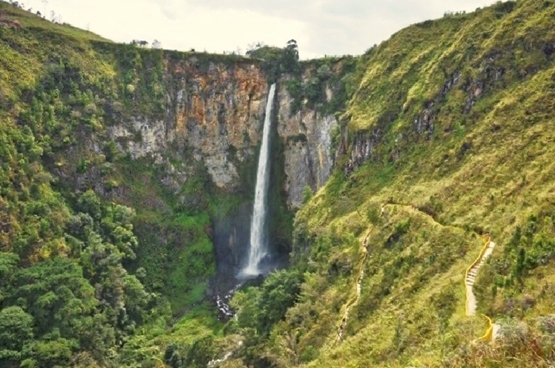 Sipiso-piso waterfall, is one of the tallest waterfall in Indonesia. The name Sipiso-piso mean ‘like a knife'; it has 120m high and it located in Tonggiang village, 45 Kilometers from Berastagi at the northern end of Lake Toba. This waterfall is formed by a small underground river of the Karo Plateau and flows out into the Lake Toba caldera. To get to Sipiso-Piso falls catch a local mini-bus from Berastagi to Kabanjahe At the bus terminal in Kabanjahe catch any bus going to Siantar and ask to get off at Sipiso-Piso. From the main road the falls are 2.5km from the main road. There are becak drivers waiting at the turnoff and go to the falls. Sipiso-Piso Waterfall has beautiful scenery and fascinating sightseeing. Among the cliffs that look greenish, the fall water is looking majestic by its grace. As we stand or sit far from the location, we can enjoy the beauty Sipiso-piso and Lake Toba from a distance at the same time. To reach the bottom of the waterfall, we do have to spend a little extra energy. For the peak of the waterfall is located at an altitude of about 800 meters above sea level. Moreover, the walking trails are steep and winding. But do not worry, once reached the bottom of the waterfall, the tiredness is going to be replaced with the satisfaction gratefulness.